Book II of the Peloponnesian War features the great Athenian leader Pericles and contains Thucydides’ remarkable apologia for his statesmanship and the Periclean regime over which he presided, which lasted only so long as he lived. A kind of golden age within a golden age, thrown away by a senseless mob, at least as Thucydides tells the tale. What cannot be discounted however is that the man Thucydides called the “first citizen” of Athens was the dominant political figure of his day and put his stamp first upon Athens, then upon Hellas and then led his people into war to conserve and defend his vision of democratic empire against a jealous and fearful Sparta. Furthermore the novel strategy pursued by Pericles was integral the Athenian polis he had reshaped according to his vision and was designed to strengthen that regime as much as to win a military victory over Sparta. In the text of Book II, Thucydides gives the reader three important narratives regarding the statesmanship of Pericles: his funeral oration; Pericles defense of his strategy before the Assembly; and Thucydides own analysis and eulogy of Pericles and his policies. From these we can see the continuity between Pericles political program for Athens at home and his imperial ambition for the role of Athens in the Hellenic world. Pericles, along with Ephialtes, had been pivotal in the decline the aristocratic, Aeropaegi faction that had been led by Cimon, whom Pericles had ostracized. Cimon’s regime was Athens as limited democracy, guided by the nobility, friendly to Sparta and deferential to Spartan hegemony. 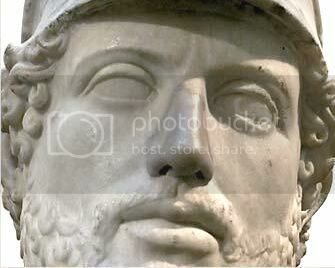 Pericles upended all of that root and branch. His Athens was to be at once radically democratic, investing power in the thetes of the Assembly, and gloriously heroic. ….Our constitution does not copy the laws of neighbouring states; we are rather a pattern to others than imitators ourselves. Its administration favours the many instead of the few; this is why it is called a democracy. If we look to the laws, they afford equal justice to all in their private differences; if no social standing, advancement in public life falls to reputation for capacity, class considerations not being allowed to interfere with merit; nor again does poverty bar the way, if a man is able to serve the state, he is not hindered by the obscurity of his condition. The freedom which we enjoy in our government extends also to our ordinary life. There, far from exercising a jealous surveillance over each other, we do not feel called upon to be angry with our neighbour for doing what he likes, or even to indulge in those injurious looks which cannot fail to be offensive, although they inflict no positive penalty…. ….”Nor are these the only points in which our city is worthy of admiration. We cultivate refinement without extravagance and knowledge without effeminacy; wealth we employ more for use than for show, and place the real disgrace of poverty not in owning to the fact but in declining the struggle against it. Our public men have, besides politics, their private affairs to attend to, and our ordinary citizens, though occupied with the pursuits of industry, are still fair judges of public matters; for, unlike any other nation, regarding him who takes no part in these duties not as unambitious but as useless, we Athenians are able to judge at all events if we cannot originate, and, instead of looking on discussion as a stumbling-block in the way of action, we think it an indispensable preliminary to any wise action at all. Again, in our enterprises we present the singular spectacle of daring and deliberation, each carried to its highest point, and both united in the same persons; although usually decision is the fruit of ignorance, hesitation of reflection. But the palm of courage will surely be adjudged most justly to those, who best know the difference between hardship and pleasure and yet are never tempted to shrink from danger. In generosity we are equally singular, acquiring our friends by conferring, not by receiving, favours. Yet, of course, the doer of the favour is the firmer friend of the two, in order by continued kindness to keep the recipient in his debt; while the debtor feels less keenly from the very consciousness that the return he makes will be a payment, not a free gift. And it is only the Athenians, who, fearless of consequences, confer their benefits not from calculations of expediency, but in the confidence of liberality. “In short, I say that as a city we are the school of Hellas, while I doubt if the world can produce a man who, where he has only himself to depend upon, is equal to so many emergencies, and graced by so happy a versatility, as the Athenian. And that this is no mere boast thrown out for the occasion, but plain matter of fact, the power of the state acquired by these habits proves. For Athens alone of her contemporaries is found when tested to be greater than her reputation, and alone gives no occasion to her assailants to blush at the antagonist by whom they have been worsted, or to her subjects to question her title by merit to rule. While Pericles was called “conservative and moderate” by Thucydides – and he certainly was a wise steward of shrewd strategic judgement in comparison with Cleon or Alcibiades – he was also in the context of the wider Greek world a social revolutionary. Moreover, a social revolutionary with demonstrated imperial ambitions and policies which Greek cities with tyrannical, aristocratic or oligarchic leadership found unsettling. Furthermore, Pericles drove home the point with the Parthenon, which he openly financed with the Delian League treasury, demonstrating that “ally” in Athenian eyes meant “subject”, Chiseled into marble on the Parthenon amidst a reconstructed Acropolis were ordinary Athenian citizenry made ideal and deified. This was clearly a political as well as a religious statement in what was the greatest temple of the ancient world. If one wonders why the Peloponnesian war took on so lethal an ideological dimension of factional strife in every city touched by the Athenians or Spartans, the answer is written on the ruins of the Parthenon. This entry was posted on Monday, October 31st, 2016 at 3:33 am	and is filed under Thucydides Roundtable, Thucydides Roundtable, Book II. You can follow any responses to this entry through the RSS 2.0 feed. Both comments and pings are currently closed.